MSL are pleased to support Children In Need - recently undertaking a 'Pyjama Day' raising money for this great cause. BBC Children in Need is the BBC’s UK corporate charity. Thanks to the support of the public, we’re able to make a real difference to the lives of children all across the UK. What do Children In Need do? Provide grants to projects in the UK which focus on children and young people who are disadvantaged. We are local to people in all corners of the UK and support small and large organisations which empower children and extend their life choices. Our grant programmes are open all year round for applications. We give our small grants awards four times a year and main grants three times a year. Click here to find out more about our grant programmes, to apply for a grant or to hear about some of the differences made to children’s lives by grants from BBC Children in Need. 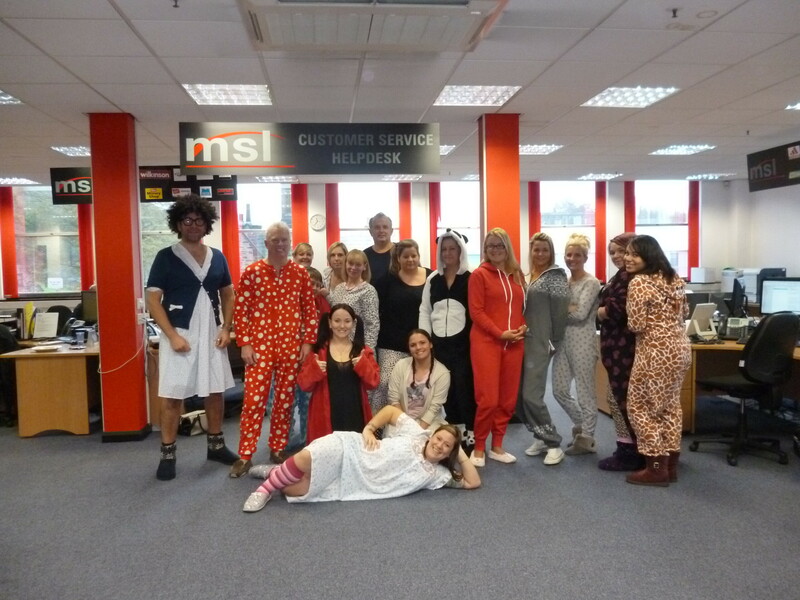 MSL are pleased to support Children In Need – recently undertaking a ‘Pyjama Day’ raising money for this great cause. As you can see from the Pyjama’s worn by the staff this was a particularly warm day in the office!